As part of our commitment to achieving 100% customer satisfaction, ayData offers customers immediate, live, remote service and support for all its fielded solutions. A dedicated and qualified technical support team is there to help resolve any issues that may arise with an ayData solution. This includes working with other third party vendors as necessary. With remote maintenance, we can provide you with fast service for your systems. 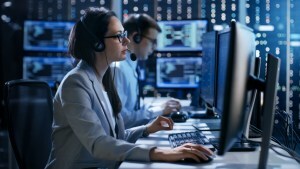 With your approval, our service engineers can access your server through a secure, encrypted Internet connection. You may be requested to allow us access to your computer or to download a support tool. Get immediate, live, service and support from dedicated, qualified ayData remote service engineers. Encrypted connection makes server access safe. No software installation on your server is necessary. Onsite service calls and long-lasting downtime can be avoided with remote support from ayData. See the work of our service engineers live on your systems. You’re in control to stop remote access at any time. Keep up and running with ayData's immediate service and support.